A Navy Doctor Goes 'On Call in Hell' Navy Cmdr. 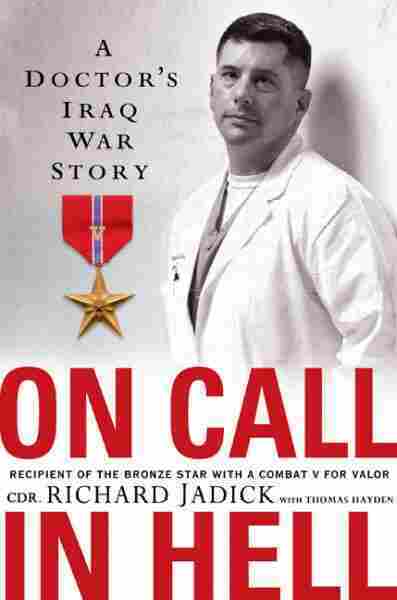 Richard Jadick earned a Bronze Star with a "V" for valor for his service as a doctor during the Battle of Fallujah, which featured some of the worst street fighting seen by Americans since Vietnam. His new memoir, written with Thomas Hayden, is On Call in Hell: A Doctor's Iraq War Story. Navy Cmdr. Richard Jadick earned a Bronze Star with a "V" for valor for his service as a doctor during the Battle of Fallujah, which featured some of the worst street fighting seen by Americans since Vietnam. His new memoir, written with Thomas Hayden, is On Call in Hell: A Doctor's Iraq War Story. Jadick volunteered to go to Iraq and in November 2004. He accompanied the First Battalion, Eighth Marine Regiment. As a battalion surgeon, Jadick led 54 navy medical corpsmen. He and other doctors developed the concept of forward-aid stations to care for casualties on the front lines, instead of having to transport the wounded for miles to aid stations away from the fighting.